As a Certified Flight Instructor there are times when I am called upon to conduct a Flight Review for client pilots, required biennially as per Federal Aviation Regulation 61.56 for them to continue to exercise the privileges of their airman certificate. 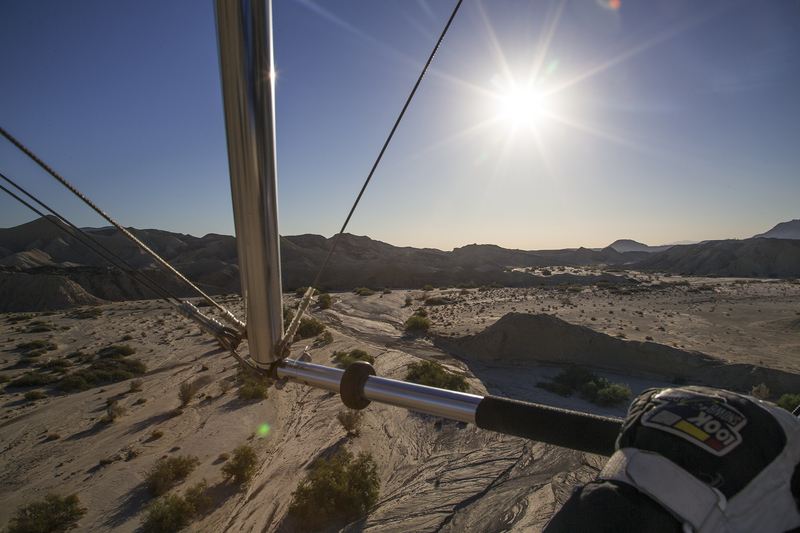 It’s a chance to review, practice, add some polish to perhaps disused operational skills, and to spend time savoring the unbridled joy of flight. 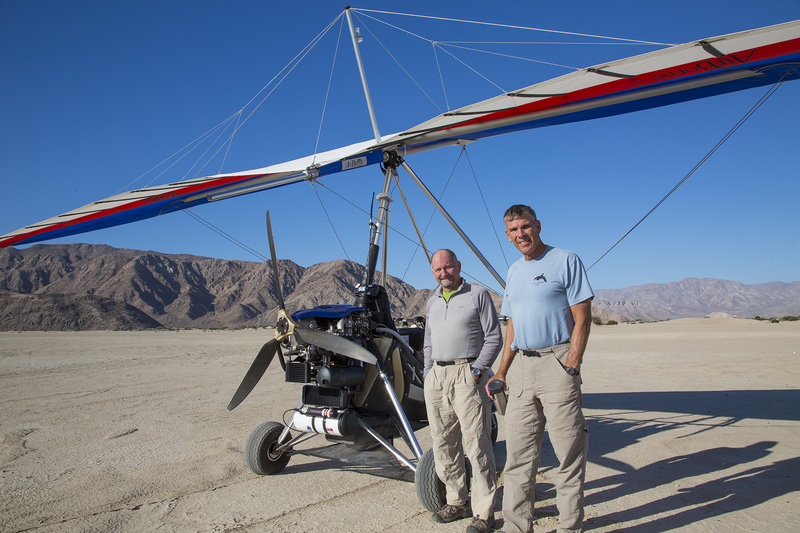 I confess that the conduct of some Flight Reviews is more fun than others, as in this past week, “working” with friends John and Howard with their Light Sport Weight Shift trikes. Howard often refers to his as the weed whacker, and you can see why. 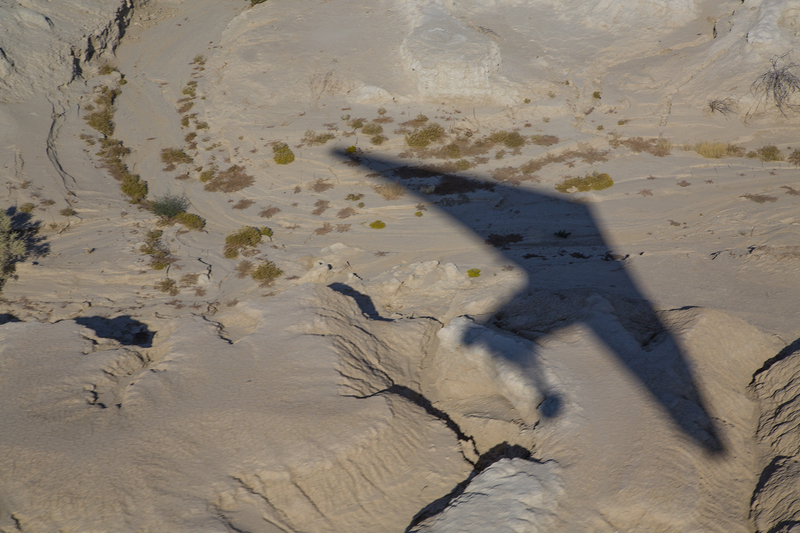 We do sometimes fly at common general aviation aircraft altitudes, but in the desert toolies, we are oft as not down where you can nearly count the grains of sand. As you can see, the scenery is spectacular, and the view of it is pretty much unobstructed. Did I mention that there is very effective air conditioning with this sort of flying? And there’s always the opportunity to work on one’s suntan. 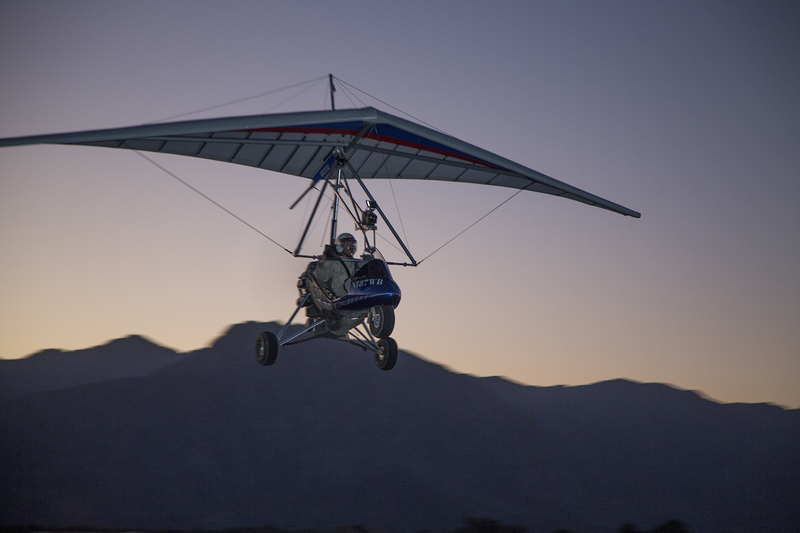 Trikes’ diminutive size and weight, and their flight attitude being controlled by the occupants’ shifting weight means that flight times are routinely early or late in the day when the atmosphere is smoothest. This is also the time of low sun—of rich colors punctuated by bold shadows. Just the stuff to make a photographer or painter effuse. Some shadows move at the speed of the earth’s rotation, some at a trike’s cruise speed. This is highly technical physics, of course, most easily explained via “the one picture is worth a thousand words” exegesis. And then there is the ritual simulated engine failure to an off-airport forced landing. Well, there are lots of definitions for airports, especially if you’re in a trike. 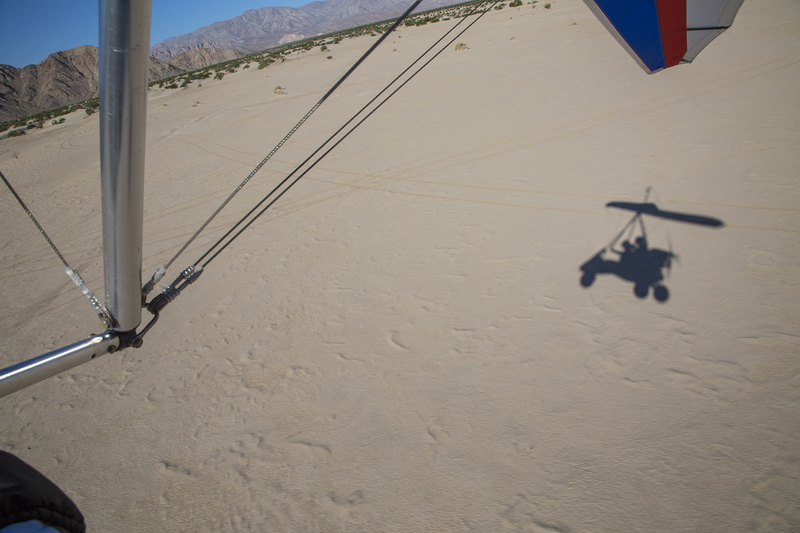 Howard scored especially high marks for this dry lake bed landing. A nice opportunity to stretch our legs and decaffeinate. So, the landing, and the bush-watering completed, it was time to demonstrate a soft field takeoff, which looks like this passing the elevation of the ritual imaginary 50′ obstacle. Okay, obstacle cleared, with us back at cruise altitude. 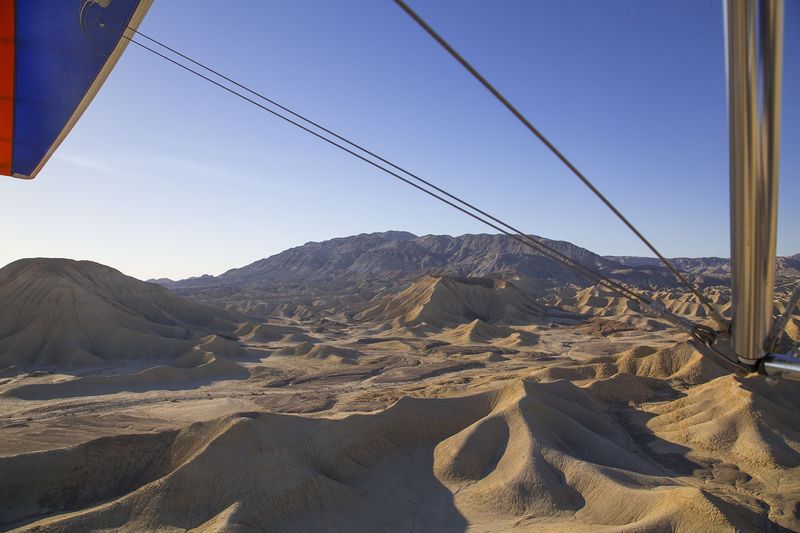 This is a great vantage point for observing wild flowers, snakes, swallows, and other desert denizens. A stressful and successfully completed Flight Review ends with a quiet return for landing at day’s end. As many of you may know, Howard’s day job is as a documentary filmmaker emphasizing the underwater environment. Cameras of this sort need waterproof housings, and those are produced by John’s company. The association we three have with all that is how we came to be chums accomplishing the niceties of the FARs on a late afternoon and early morning. Howard got some extra practice by flying his trike while John and I accomplished his FR. 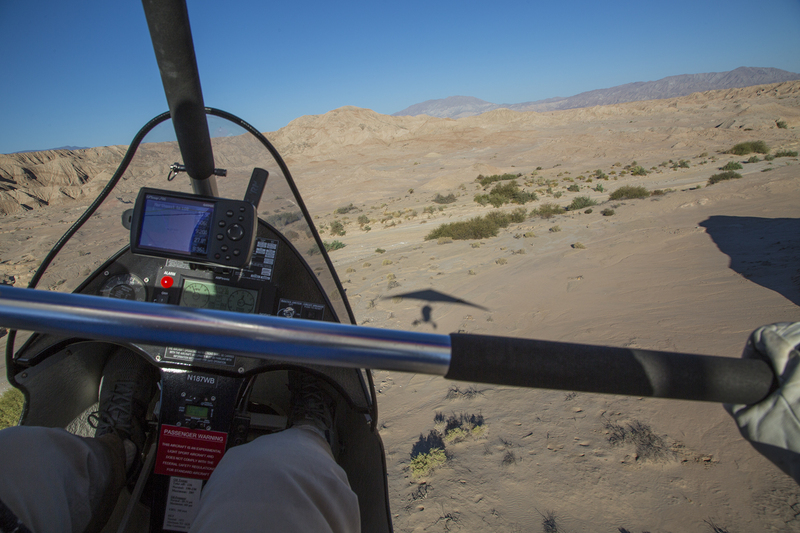 Howard took this as opportunity to roll the cameras on the scenery and the conduct of John’s and my flying. Like I say, some Flight Reviews are just more fun than others. If you need a password for this link, it is—badlands.